USD/SGD is currently trading around 1.3583 marks. It made intraday high at 1.3588 and low at 1.3575 levels. Intraday bias remains neutral till the time pair holds key support at 1.3550 mark. A daily close above 1.3610 will test key resistances at 1.3672, 1.3720, 1.3770 and 1.3790 marks respectively. Alternatively, a consistent close below 1.3562 will drag the parity down towards key supports at 1.3570, 1.3538, 1.3490, 1.3465, 1.3422 and 1.3315 levels respectively. Singapore Q4 2018 GDP final yy decrease to 1.9 % (forecast 2.1 %) vs previous 2.4 % (revised from 2.2 %). Singapore Q4 2018 GDP final qq stays flat at 1.4 % (forecast 1.6 %) vs previous 1.4 % (revised from 1.6 %). 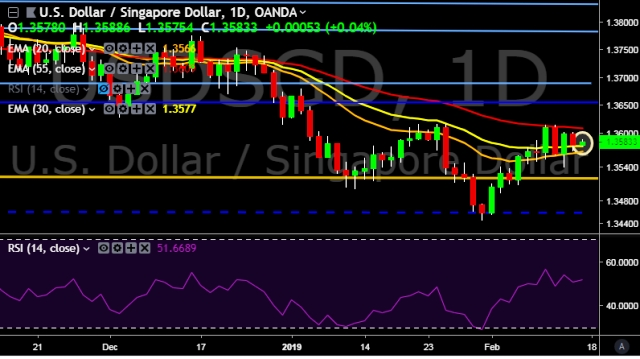 We prefer to take long position on USD/SGD around 1.3580, stop loss at 1.3550 and target of 1.3610.